Chocoholic indulgence is irresistible. Chocolates have been around for ages. In fact, much longer than the stunning packaging design that covers this sugary delight today. September 13th is famous as National Chocolate Day #NationalChocolateDay in the United States. The day celebrates Milton S. Hershey’s birthday. It’s the best time to treat your sweet-tooth while witnessing some of the best packaging designs. Since a product packaging design has a significant impact on how we shop anything, companies come up with creative ideas to influence our decisions. This Lithuania-based brand is known for presenting its sweet delights in colorful packaging. Its product packaging design is filled with handmade illustrations that symbolize the bold flavors. As far as design is concerned, it has many intriguing aspects. Each of their bars has a specific name and number. The color of the brand name and number matches with each other. This detail is printed on a crisp white label that also showcases the name and ingredients in a refined way. The coloring of the name matches the overall color theme of the packaging. The surrounding packaging design is a treat to eyes. It comes with beautiful graphics of herbs, flowers, fruits, and leaves printed on it that enhances the chocolate-eating experience. This bean-to-bar brand is famous for its authentic products. They infuse their personality and persona in each of their offerings even in packaging design. Each of their chocolate bars includes a character for storytelling. However, the story and the character depend on the flavor. The bright and engaging illustrations with fun and creativity make this brand stand out. The use of pastel shades in the packaging gives a calming feel. It’s the soft lines and captivating designs that attract consumers for a humorous joyride before they unwrap the packaging. 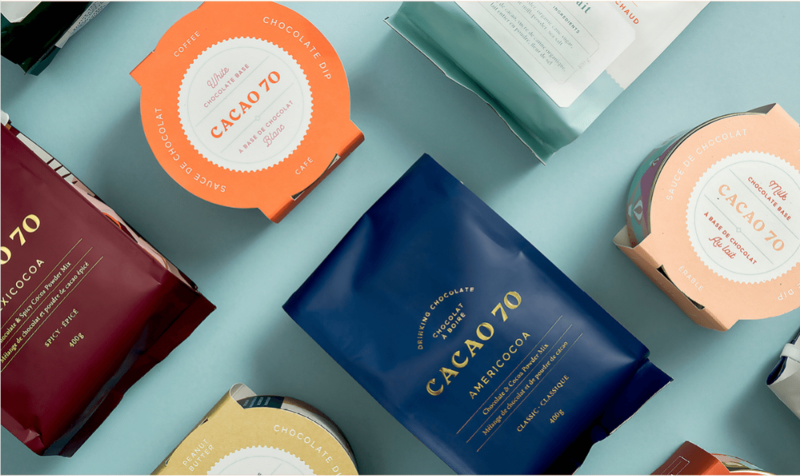 Be it retail packaging design for their bars or an exhaustive list of chocolates, The Good Ship Company knows how to stand out. The white boxes with gold designs perfectly capture the high-end feel of their products. It also gives it a luxury impression. The wide strip in bright color at the top of the box, distinguishes the variety. It’s been positioned strategically along the top of the box that captures consumers’ eyes before they go further. The clever use of black text also matches the whole theme perfectly. Crude Raw Chocolate is known for its minimalistic packaging style. The structure of the packaging is clean and straightforward. Corrugated card twisted in rectangular boxes showcases an interesting contrast with metallic foil. The use of geometric metallic foil resembles deco-style trimming. Each package has matching geometric shapes but in different metallic foil. Texture, paper, color, and shape all give this brand a cohesive visual identity. 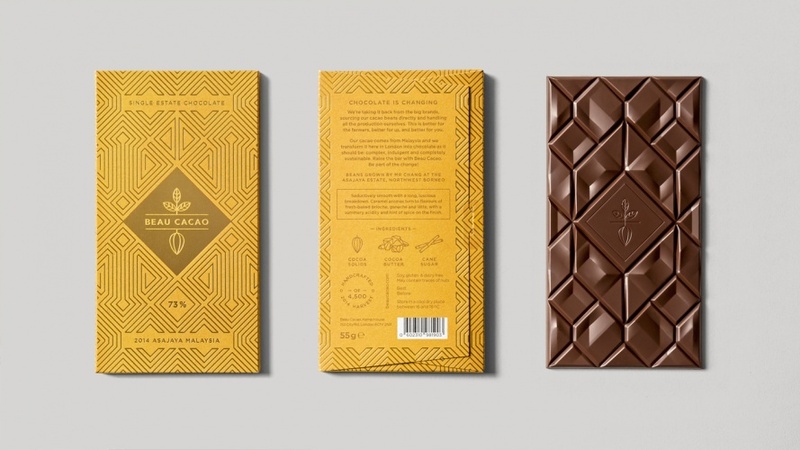 The chocolate bar packaging of this brand combines geometric patterns, quality paper, and brilliant color to catch consumers’ attention. The use of harmonizing coral shades with a tint of gold gives each box a clean yet elegant appearance. The diamond-shaped pattern presents the brand’s name with its cocoa plant logo. This representation gives a natural flair to the packaging. Different flavors have different color combinations. For example, the gold and bright yellow packaging represents caramel flavors, while the coral with gold represents sandalwood and paprika flavors. 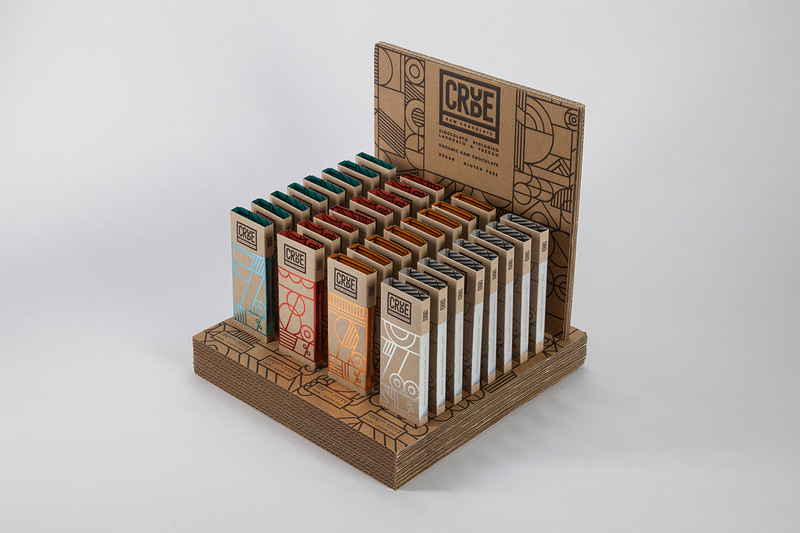 Not only packaging but chocolate bars have been designed beautifully too. Each bar comes wrapped in a sheet of solid gold for a luxurious feel. The above packaging designs not only help in creating a brand identity but influence buyers’ behavior as well.